Best Yosemite National park camping sites. Go tent or RV camping in Yosemite California for your next vacation. Yosemite National Park offers a number of campgrounds for camping. Some require advance reservations, while others are first-come, first served. For other lodging such as hotels, cabins and Bed and Breakfast, see Yosemite lodging. Yosemite is one of the most beautiful places in the world! I think the best way to enjoy this outdoor wonderland, is to experience it by camping in Yosemite. There is a 30 night camping limit in Yosemite National Park each calendar year. During the popular season from May 1 - September 15, camping stays in Yosemite is limited to maximum of 14 nights, and only seven of those nights can be in Yosemite Valley or Wawona. Note: Each year, the dates vary, so these are approximate dates in the table below. If there is a lot of snow, that may delay the opening of some of the campgrounds. 1. How many people are allowed per camp site? A maximum of 6 people (including children) and 2 vehicles are allowed per campsite. Additional free parking is available near each campground. 2. Can I sleep in my car? Unless stated otherwise for a particular campground, sleeping in vehicles is not permitted at any Yosemite campground, a never anywhere else in the park. 3. When can I check into my Yosemite campsite? Check-in time is noon. 4. Are bears a problem for Yosemite National Park camping? How do I store my food to keep it away from bears? Food must be stored properly to keep away from bears, 24 hours a day. During the day it may be stored in a locked car out of sight, but at night it must be stored in a locked food locker, which are provided at the campsites. 5. How much does it cost to camp at Yosemite? The Yosemite camping fee is approximately $12 - $26 per night, depending on the campground, except for camp 4, which charges a small fee per camper. 6. Are the roads open? - Yosemite roads may be closed due to the weather, snow conditions, renovations or storm damage. Access varies by season. Always check before you plan your trip. Tioga pass is closed during the winter. 7. Where is Yosemite? - Yosemite is located in northern California, about 165 miles east of San Francisco, 280 miles north of Los Angeles, and 400 miles north of San Diego California. For more details see map of Yosemite. 8. Are reservations required? - Reservations are strongly recommended, as the campgrounds fill up during the busy season, typically April through October. Below you will find the specific requirements for each campground. Reservations open months in advance, see Yosemite Camping Reservations. 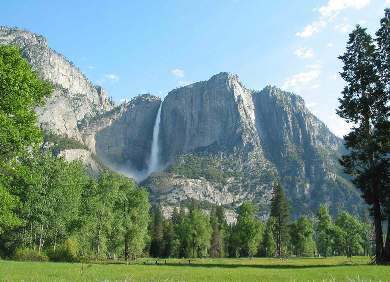 Yosemite Valley is the most popular location for Yosemite National Park camping. There are 3 campgrounds for tent and RV camping that require reservations during the summer months. One of these, Upper Pines campground, is open all year (weather permitting). Camp 4 is a first-come, first-served walk-in campground, popular with rock climbers and backpackers. Where is Yosemite? 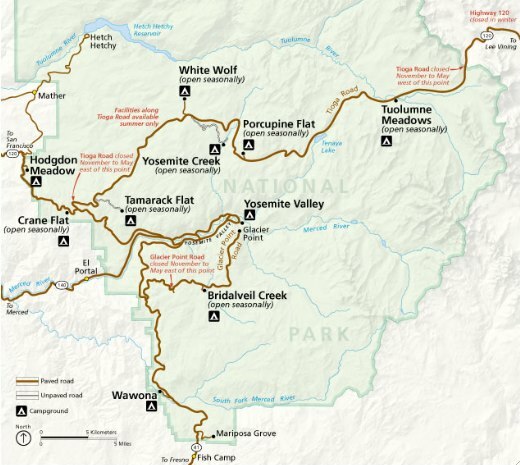 See additional Yosemite National Park Maps. There are two campgrounds south of Yosemite Valley for more great camping in Yosemite. The Wawona campground is located near the Wawona area and Mariposa Grove of Big Trees. Bridalveil Creek campground is located along Glacier Point Road off highway 41. There are 7 Yosemite National Park camping locations north of Yosemite Valley. Only Hodgdon Meadows campground is open year around. Note that Tioga Pass on highway 120 going over the Sierras is closed in the winter due to snow. These Yosemite National Park camping sites are further away from the crowds in Yosemite Valley. For updates to these dates, see the National park Service website at www.nps.gov. Reservations may be required when camping in Yosemite National Park, based upon the campground and in some cases, the season. Note the Wawona group site has additional reservation due dates for the winter months between December and March.